The Twirl builds on the success of the award-winning Twist, but takes advantage of design experience of higher end Black Rhodium cables like Samba VS-1. Excellent value for money! Enhancing the performance of the highly awarded Twist, the Black Rhodium Twirl speaker cable has larger conductors for lower impedance due to a 2.5 square mm conductor cross section, over three times the size of Twist. The twirl also has a thicker insulation resulting in lower ‘Transient Phase Distortion’ because the generated magnetic field in the wires reduces as distance between them increases. Providing an even clearer diction of the words sung by massed choirs due to this lower Transient Phase Distortion, the cable also retains the award winning features of the Twist. 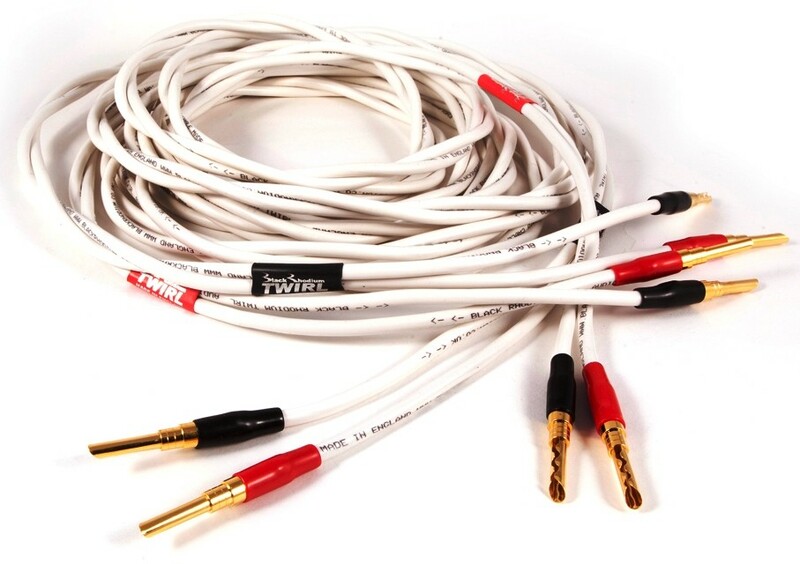 When the quality of hi-fi system justifies a higher grade cable, the Twirl is ideal for long cable runs with less signal loss than other comparable quality cables at a similar price point. The Black Rhodium Twirl gives a very tight bass and stable stereo images due to its low impedance giving the amplifier greater control of movement of the loudspeaker bass drivers. Twisted along its length, the cable is prevented from acting as a “loop aerial” for airborne radio frequency interference which can audibly distort the sound quality. Manufactured in England, the cable's silicone rubber insulation is used for low dielectric loss ensuring extremely low distortion due to sound energy in absorption effects being absorbed in the insulation and released at a later interval to create highly audible time-smearing distortion. The positive and negative cores are connected in opposite directions. When cables are connected this way and in the same direction, the noise floor between notes lowers giving ‘blacker’ silences in the interval between musical notes and enhances reproduction of the musical edges and natural decays in music. To prevent the Twirl cable losing its twist during handling, it features a printed heat shrink to bind the two conductors six inches from the end. Terminated with high quality gold plated Z plugs, it offers a secure fit for improved connection. Also available with Rhodium plated Z-plugs for a £60 premium (please call us to order).